Six billion years in the future, Earth has been destroyed, and the human race has left to settle a world on the edge of the galaxy. The colonists have everything they need to start a new life, but some of them want to head back home and start over there. The home galaxy is deserted in the wake of the destruction left behind after the decimation of the earth. Or so the survivors think. On the surface of an icy comet grows a great tree unhampered by gravity or atmosphere. Torris’s people must harvest frozen airy daily, and hunt meatbeasts and stovebeasts to survive. When Torris goes on his vision quest to the top of his tree, he finds out the world is a far different place than he ever imagined. He meets Ning, a female hunter from a nearby tree-bearing comet, and his world changes forever. But the cultural differences between his tribe and Ning’s are nothing compared to the revelations in store when a massive starship arrives, bringing changes Torris and his tribe could never have foreseen. 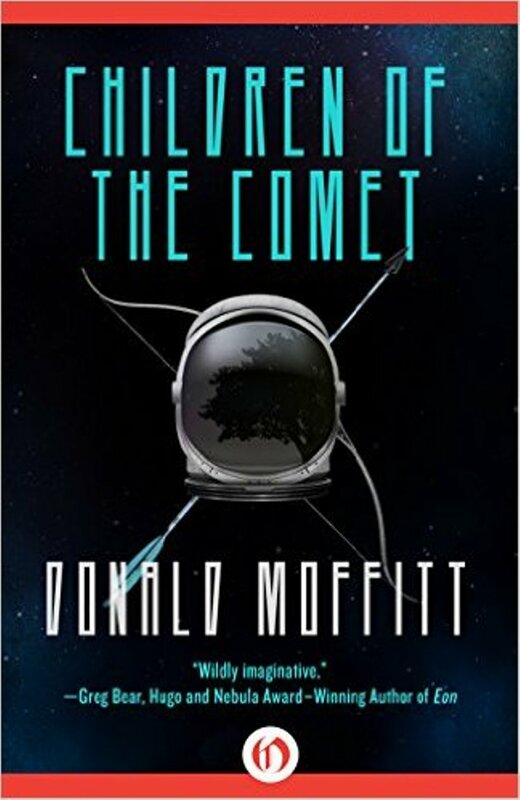 Children of the Comet is the newest book by sci-fi master Donald Moffit. The intricate tale of humanity’s descendants—both Homo sapiens and a new species—is intriguing and well-crafted, with science layered between adventure to create a story that will intrigue even readers who aren’t science fiction fans. How Many Stories at a Time?